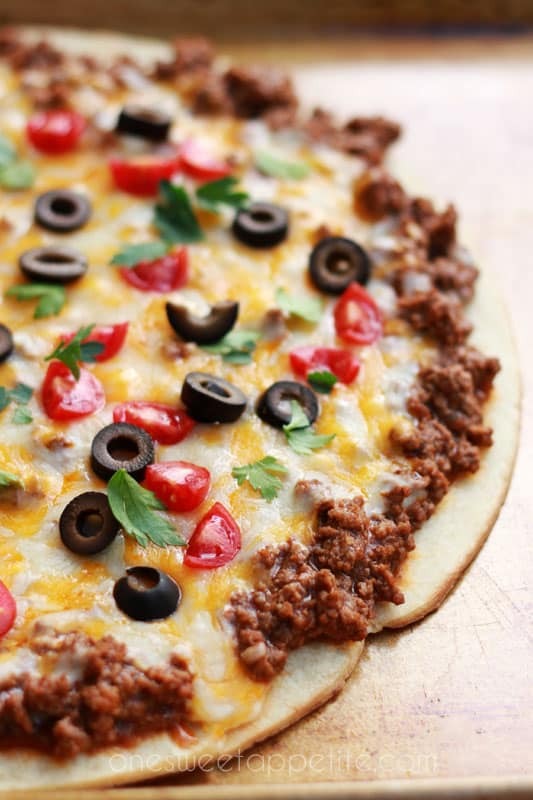 Celebrate taco Tuesday with this easy taco pizza recipe! 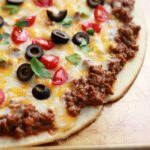 Your favorite pizza crust is topped with taco spiced ground beef, Mexican shredded cheese, and all of your favorite taco toppings! Easy weeknight dinner recipe that is also kid approved? 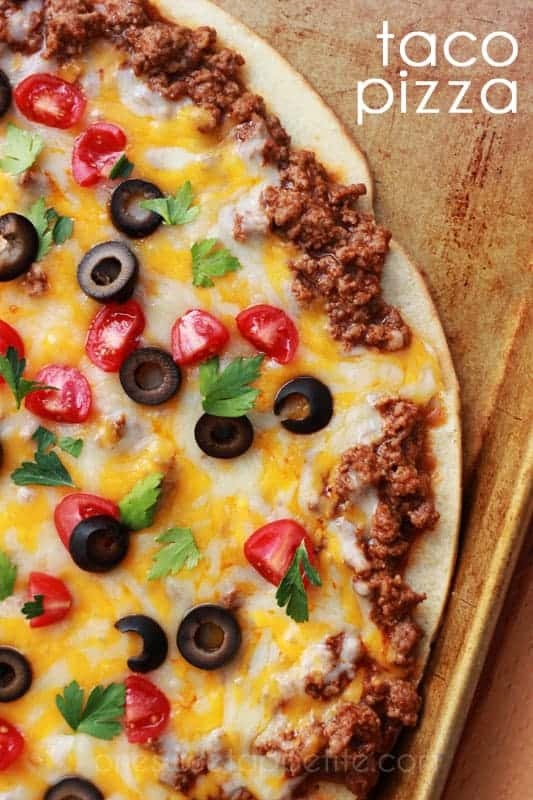 That is what you get when you make this taco pizza! It is on the table in under 30 minutes making it a family favorite meal and one that is regularly on our rotation! 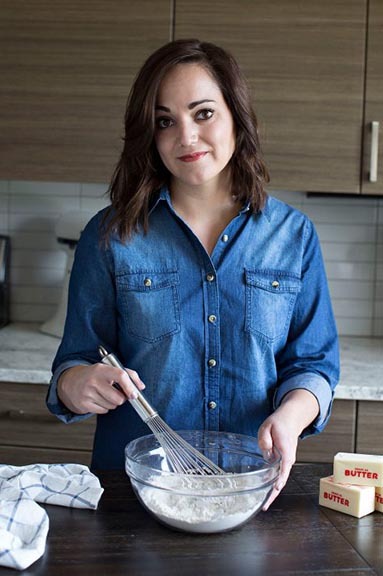 You all know that I am all about simple dinner recipes that taste amazing. This one does not fall short. The best part? It is completely customizable making it the best way to spice up Taco Tuesday. The hardest part will be deciding what toppings you want to add! 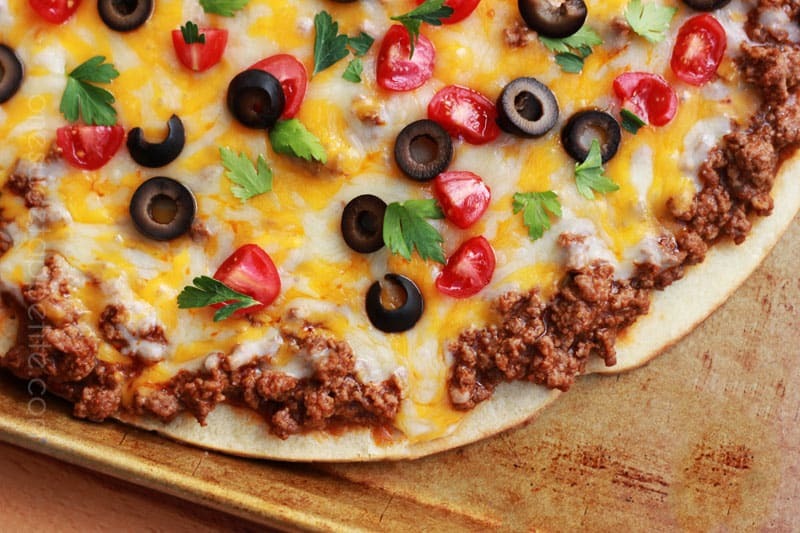 What is on a taco pizza? I have seen soooo many versions of taco pizza floating around. Many use refried beans as t he base, but I decided to take a different approach. I used a store bought pizza crust (I know, such a cheater) and topped it with ground beef that had been cooked and combined with enchilada sauce. This gives you a taco filling that is moist and loaded with flavor. Spread that over your prepared crust and sprinkle with Mexican blend cheese. This is a great recipe to get the kids to help with. Once the ground beef has been cooked it is all assembly. Have them wash their hands and start sprinkling on the toppings. They will love being involved and you will get some quality time! Gather your ingredients. You want to pick your favorite pizza crust and any toppings you will want to use. In a large skillet, cook the ground beef with chopped onion and diced peppers. Once the meat has browned and the peppers are soft you will sprinkle taco seasoning over the filling. Stir in one can of your favorite enchilada sauce. Spread the meat mixture over your prepared pizza crust. Top with a hefty amount of cheese. Sprinkle with your desired toppings and bake 10- ish minutes. We like to serve this with homemade guacamole and sour cream. Sometimes even a dash of hot sauce. It is an easy weeknight dinner recipe the entire family will enjoy! Cook the ground beef with the onion and peppers until browned. Sprinkle with taco seasoning. Drain the grease and return to the pan. Stir in the enchilada sauce. Spread the beef mixture over your prepared pizza crust. Sprinkle with the cheese. Bake 8-12 minutes or until crust is lightly browned and cheese is bubbly. Top the pizza with cilantro, olives, tomatoes, and any other ingredients you might like.